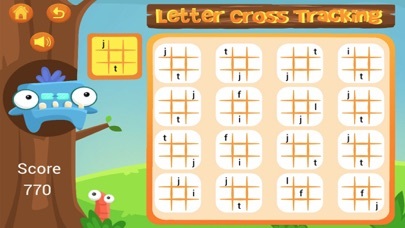 Letter Cross-Tracking shows groups of commonly-confused letters and those that frequently cause issues with reversals and inversions on tic-tac-toe-like grids with four to nine spaces. Players need to look at a model showing two or three letters and choose the matching grids from the field of four to sixteen elements. Letter Cross-Tracking is a very high quality app. Developers created a clean-playing activity that is intuitive to use. The three sets of puzzles are nicely divided by complexity, and within each of these sets, there are four levels of play in the full version of this app. 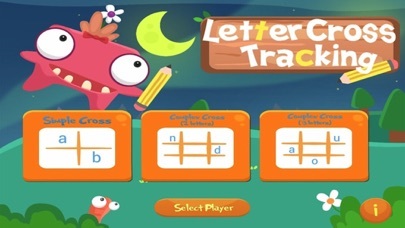 Teachers or parents can set up three different players to keep score. One drawback, however, is that the app does not keep specific records of student performance on various subtasks, such as discriminating b’s and d’s or noticing the letters’ position on the grid. This sort of information would be helpful to teachers, in particular, who are trying to diagnose student weaknesses or areas of concern for remediation. Letter Cross-Tracking provides a thorough practice activity that will help young students learn to discriminate easily confused, reversed or inverted letters as well as learn to pay close attention to detail about position in space. All of these skills are vital for reading success. This app provides vital practice and repetition that will help students who are struggling with these skills. The easiest game in the app, “Simple Cross,” offers a four-section grid with two letters in random quadrants of the figure. It presents a model, and four similar figures, one of which matches the model exactly. The second level has a selection of eight similar figures and multiple matches to the model. The third level has twelve similar figures, and the fourth level has sixteen. In this way, developers increase the complexity of the task. The middle game is called “Complex Cross (2 Letters),” and uses a nine section grid similar to a tic-tac-toe board with two letters in random positions. Again there are four levels within the game, ranging from four selections up to sixteen. The final game is called “Complex Cross (3 letters)” and increases the difficulty by using three figures in each model with from four to sixteen selections. The feature that puts this app head and shoulders above most reversal/inversion practice apps is the twist of using the grid to help children scan for position in space. This skill will help them in many other academic tasks, since it trains the eye’s ability to scan left to right and top to bottom of the page, to notice small differences (on one puzzle, for example, the letter n is in the top left section with a u in the middle left section, and distractors include a grid with a u in the top left section and an n in the middle left section), and to attend to the letters’ position relative to other letters, which helps build sequencing and spelling skills. This app tries to be entertaining, and while kids might be intrigued for a few rounds, it would get quite repetitious after the lengths of practice required to actually improve the skills involved. After each puzzle is presented and an answer chosen, a monster makes a brief comment on the effort, either responding with a positive word such as “Awesome!” for a correct response, or a negative sound or word for an incorrect response, such as “Oops!” The app keeps a running score for a player’s performance (even across levels and games) that increments by ten points for a correct response and decreases by 5 points for an incorrect response. Developers should consider dressing up the entertainment factors for this app if they want to be more engaging. Some suggestions include having a goal for the points, such as mini-games that become available after ten or twenty correct responses, varying the reward sequence (the monsters changing color, voices, and phrasing won’t hold children’s interest for long), or unlocking additional reward screens that tell part of a story at various point intervals. This app is a good value. The free download includes 50 puzzles at the easiest level of all three games, so parents and teachers can get a good idea of how children respond to the activity. That’s a total of 150 puzzles, and for many students, that will be sufficient to practice the skills involved. There is an in-app purchase that unlocks another 450 puzzles for a total of 600 (50 more at each level in each of the three games). This costs $3.99 before tax which may seem a bit pricy to many families. When combined with the somewhat bland rewards and motivational strategies, it may be tough to get kids who need this kind of practice to actually go through all 600 puzzles. This app is child-friendly. It does contain an in-app purchase, but there is a parent gate that will be effective for emergent and struggling readers that the app is designed for.